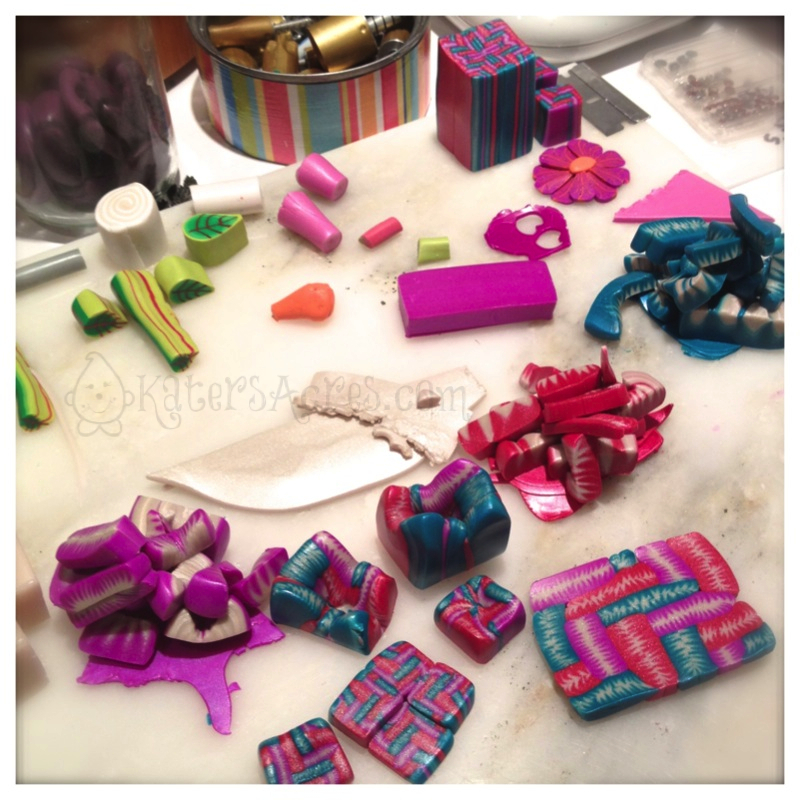 Home / Polymer Clay / Hints, Tips, & Tricks / What to Do with That Scrap Clay? Make Some Cute Pens! What to Do with That Scrap Clay? Make Some Cute Pens! It’s always a challenge to figure out what to do with all those scraps that you have left over from making a cane. I have more scraps from making canes than any other single thing that I do in my studio. I suppose it’s just the nature of the beast. So the real question becomes this … what are you going to do with all that scrap clay? 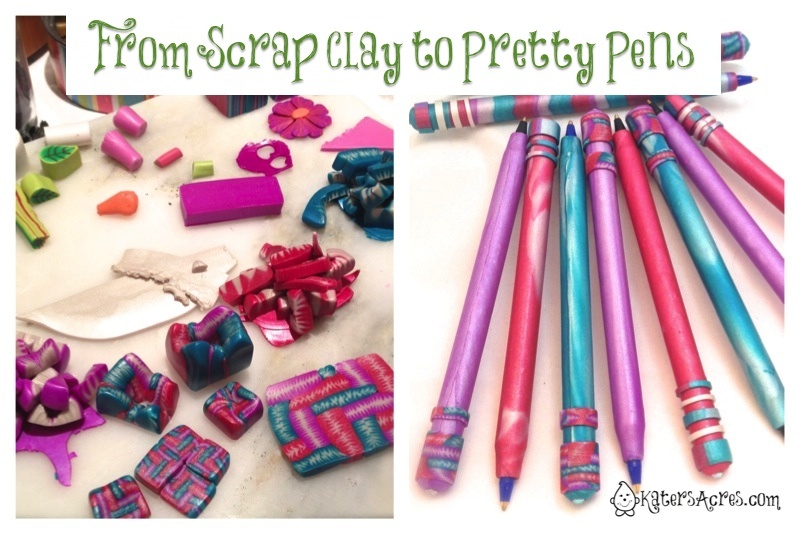 I have written several times about scrap clay and the things that you can do with it. My most popular technique with my readers is this one, taking those colors and making brand new blended color sheets. 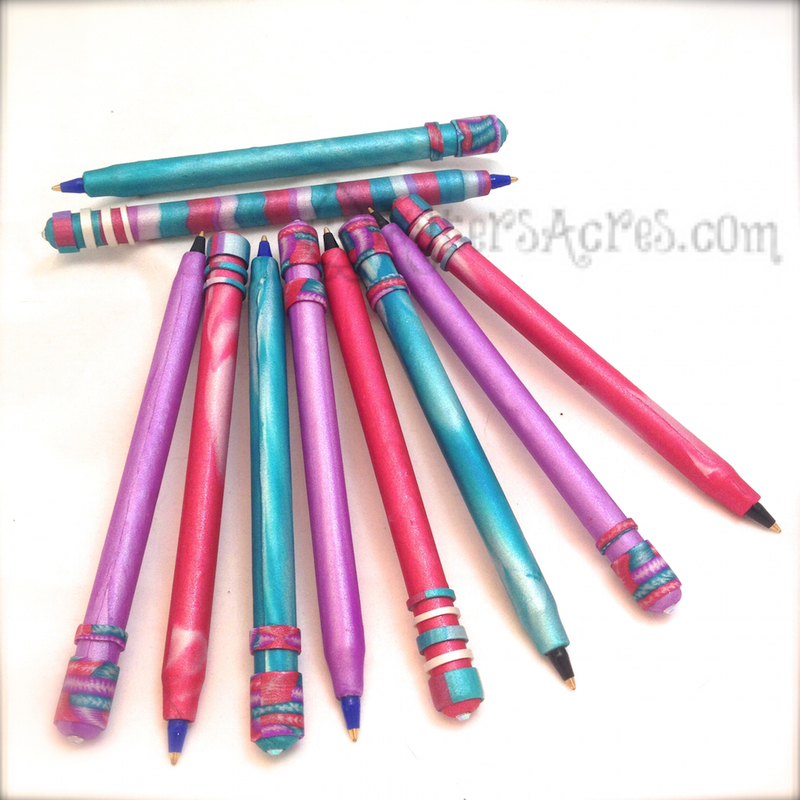 But here’s a little secret … if you’ve been a reader of my clay blog for some time now, you’ve already realized that one of the things that I’m addicted to is polymer clay pens. So one of the things that I did was turn this pile of scrap clays from my basket weave cane into some new & beautiful pens for myself, for family & friends, as gifts & freebies, and to giveaway to FaceBook fans. I could have done a million things to make these into pens. However, that being said, what I chose to do first was to create a long strip of the cane ends that I sliced off to use as decoration on the pens. I used the pile of purple, magenta, & peacock to make individually colored pens. Notice how those solid colors have pearl in them … I didn’t completely combine these colors. Rather I marbled them for a cool effect on the pens. The cane ends that were a combination of all the colors, I very simply made into a striped sheet and covered the pen with it. Please know that making these 10 pens was not a quick procedure. Just because it’s scrap clay does not mean that it will magically make itself into something cool. These 10 pens took me over 3 hours to make & complete. However, when I was done I went from a pile of scrap clay to 10 gorgeous pens. All they need now is a bit of sanding, polishing, & they are ready to go. What Else Could I Do with Scrap Clay? I didn’t have to turn this pile of gorgeous colors into the scrap clay pens you see above, that’s just what I was inspired to do at the moment (most likely because I’m addicted to them). But this same batch of scrap clay could have been turned into buttons, hearts, magnets, pendants, lentil beads, beads of courage … that’s just a tiny list of possibilities. Remember that when it comes to polymer clay there is ZERO waste. Sometimes it just takes some creative energy to make that “useless scrap clay” become something wonderful. Be honest … those pens don’t exactly look like they were made from scraps, do they? Challenge yourself … be creative, but never give up on your scraps and turn them into black “muck” until you have too.